For the cake: Preheat oven to 350°. Coat two 9-inch round cake pans with cooking spray and line the bottoms with parchment paper. Coat parchment paper with cooking spray and dust with flour, tapping out excess. In a medium bowl, whisk 2 cups flour, baking powder, baking soda and salt. In a small bowl, combine milk and vinegar. Reserve. Meanwhile, in a large heatproof bowl set over a saucepan of barely simmering water (water should not touch bottom of bowl), mix sugar, chocolate, cocoa powder, water, butter and vanilla, stirring until chocolate melts and mixture is smooth. Cool slightly, then whisk in the milk mixture. Whisk in eggs. Slowly add the flour mixture and whisk until smooth. Do not over mix. Pour mixture into cake pans. Bake for 25-30 minutes, or until inserted toothpick comes out clean. Cool completely in pans on a cooling rack. For the filling: Using an electric mixer, beat cream cheese, butter and salt until smooth. Gradually add powdered sugar and mix to incorporate. Add almond extract and mix until smooth. Spread between cake layers once cakes have cooled and refrigerate cake. For the berry sauce: In a medium saucepan, combine the berry medley, sugar and water. Bring to a simmer and cook, stirring occasionally, until berries are cooked down and have released their juices, about 25 minutes. Strain through a fine-mesh sieve and press solids to release all juices. Discard solids and refrigerate sauce until ready to serve. For the ganache: While the cake is refrigerating, place chocolate in a medium bowl. In a small saucepan, heat heavy cream until just simmering. Pour over chocolate and stir until smooth. Let cool 5 minutes. Pour over the top of the cake and spread down around sides in an even layer. Swirl with spatula to create a finished look. 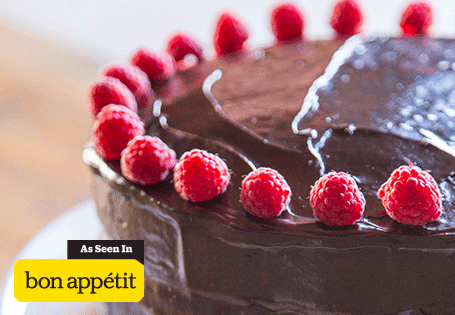 Arrange raspberries around the top perimeter of cake. Refrigerate until ganache is set, at least 30 minutes. Allow cake to sit at room temperature for 1 hour before serving. To serve, cut cake into 12 slices. On each serving plate, pool a few spoonfuls of berry sauce and top with a slice of cake. *These are Regional items that may not be available at your local store. **These are Seasonal items that are only in stores for a limited time and may no longer be available.